Hostgator right now is giving you unlimited space and bandwidth for all shared hosting packages. Also, for the Baby and Business plan they allow unlimited domains. It’s a very good deal for just $4.95, $7.95, and $12.95 a month for the Hatchling, Baby, and Business plans if paid 3 years at once. If you don’t want to pay for 3 years at once you can pay it for 2 years, 1 year, or even monthly, which is $8.95, $9.95, and $14.95 a month, still not that much higher than 3 years at once for the Baby and Business plans. Blogflux.com made me think that my PR was 0 while my actual PR was 2 after I checked it with other websites. Darn, that might have made some people go away. Don’t use their website or code to check PR anymore until they fix it. 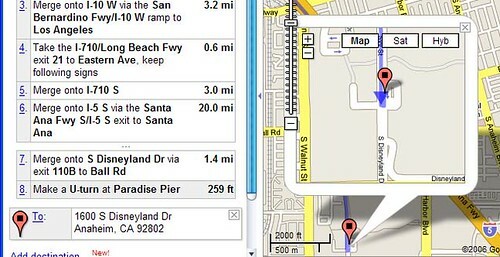 When I got the driving direction to Disneyland in Google Map, it told me to Make a U-turn at Paradise Pier for 259 ft and then stop when I got there. What? It makes no sense to make a U-turn like this. Yesterday I started to have problem connecting to the Chinese websites. They all seemed to be down. I thought it was my connection’s problem, but it isn’t. It was because the earthquake in Taiwan that “damaged telecommunication cables linking the Chinese mainland, disconnecting users with overseas Websites.” Today the problem seems to get better as I can connect to many websites again, but still there’s problem with the network in China. Many websites are still not working and the connection is still very slow at times, and because of the damage, many users from China can’t open properly websites located in the U.S. or other countries. Do you want to get additional cashback besides the discount that they offer online? On the website InstantProfitz you “can get automatic rebates for shopping at your favorite merchants – and all sorts of new ones too! This ‘cash back’ is in addition to and separate from any discounts you may get at hundreds of online merchants!” All you need to do is to make qualified purchase at their listed merchants through their links, and you will get the percent cash back listed on their website for that merchant after 30 days. There are many famous online stores including Radio Shack, Circuit City, Best Buy, and even Half.com on their list; through the links on that site you can save some additional $$$ besides their original discounts. For more information click here, also don’t forget to check out the FAQ, it contains some important information on how it works.